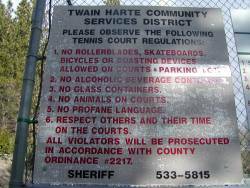 The Twain Harte Tennis Group maintains and administers three local tennis courts under authority from the Twain Harte Community Services District. 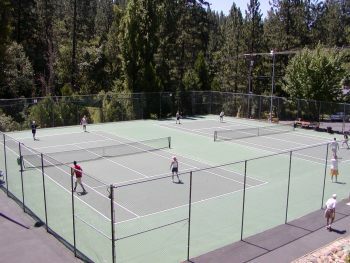 The courts� renovation was made possible by a charity drive by tennis supporters headed by Richard and Lynn Merrifield. There is no fee to play on the courts. Hours are 7am to dusk. Twain Harte recently celebrated the grand opening of Greg's Racquet Works at 22905 Twain Harte Drive (209)586-2041 www.gregsrw.com (in the A-Frame opposite the Shell Station). 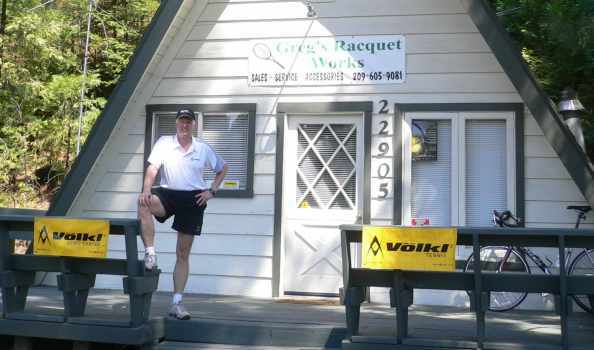 Greg Pitcher, the owner, has been operating Volkl sales from his home and has been coaching and stringing tennis racquets for Summerville, Sonora and Calaveras High for many years. The new shop specializes in Volkl tennis racquets, but can special order others. Greg offers demo racquets , rental racquets, racquet customizing, Volkl clothing, stringing, and repair. Lessons are also available. 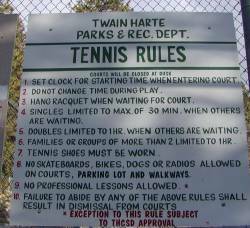 Twain Harte's three tennis courts are popular with players.